Northwest treaty tribes are continuing to keep a careful eye on the European green crab that has infiltrated Puget Sound and the Washington coast. 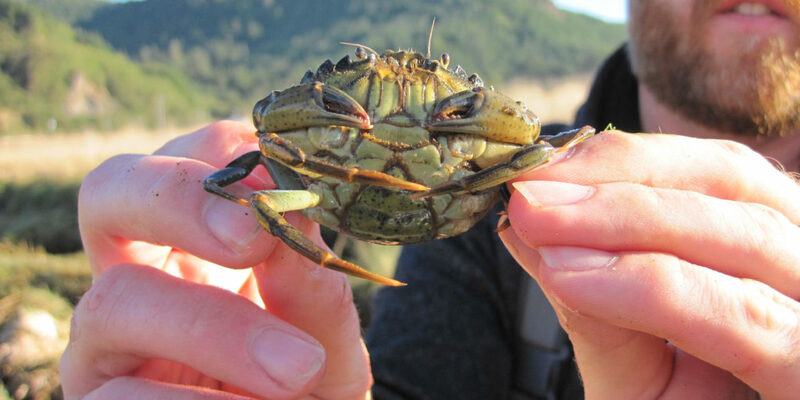 Invasive European green crab could threaten Dungeness crab, oyster and clam fisheries because they feed on clams, oysters, mussels, marine worms and small crustaceans. In large numbers, they could also damage eelgrass beds by eating them and degrade nearshore habitat by burrowing into the mud. The Makah Tribe, which has seen the biggest influx of crab, is monitoring a population that could be establishing itself in two coastal rivers that empty into Makah Bay. Staff from Makah Fisheries set a total of 2,228 traps between April and September 2018 in the Wa’atch and Tsoo-Yess Rivers, and in nearshore areas of Neah Bay. They trapped 1,029 green crabs in those rivers alone, said Adrianne Akmajian, the tribe’s marine ecologist. Around the corner in Neah Bay, no live green crab were found but a few molts, or discarded shells, were discovered. The tribe set a handful of traps through the winter and caught an additional 30. “The catch definitely goes down in the winter as we would expect because of lower salinity and colder temperatures, and winter tides make it difficult to set out traps, but we still caught a few in the lower rivers,” Akmajian said. For 2019, the tribe plans to continue trapping every two weeks from April to September, Akmajian said. Other tribes, including Lower Elwha Klallam, Port Gamble S’Klallam, Stillaguamish and Suquamish, are trapping green crab in partnership with Washington Sea Grant’s Crab Team. But the numbers found inland are minimal compared to the coast. In 2018, 69 green crab were found in Dungeness Bay, four were trapped at Westcott Bay off San Juan Island, two were found in Port Townsend Bay and one on Whidbey Island. No new crab were found at the monitoring sites in Fidalgo Bay or Padilla Bay. On the strait, the Pysht River estuary continues to show no signs of crab. In January 2019, three adult crabs, including an egg-bearing female, were captured in Samish Bay by shellfish growers working for Taylor Shellfish Farms. The Stillaguamish Tribe will begin its third year of monitoring in April at a couple of sites in the North Sound area. “We have millions of pounds of eastern softshell clams and miles of muddy sloughs that crabs would thrive in if they make their way here, so the early warning system is very important for us,” said Franchesca Perez, Stillaguamish shellfish biologist. The Jamestown S’Klallam Tribe partnered with others to conduct intensive trapping throughout the northeast Olympic Peninsula in 2018. The tribe focused on Sequim Bay, Jimmycomelately Estuary and Washington Harbor. They set 254 traps but did not find any crab, said Neil Harrington, the tribe’s environmental biologist. The tribe and the Washington Department of Fish and Wildlife monitored bays from Discovery Bay to Hood Canal Bridge and around Marrowstone and Indian islands. In addition, the tribe conducted follow-up trappings in Dungeness Landing, Kilisut Harbor and Kala Point after the state and Crab Team found a single crab at each location.